There’s a new favorite meal around the house. I was given a 12″ baking stone for the Egg for Christmas and we’ve generally worked out the kinks of how to make really awesome pizza at home. We tend to pick up fresh balls of dough at the local supermarket, but you can buy the pre-made pizza crusts to save time. Once you get the hang of this, you can run a pizza through the Egg every 8 minutes or so. The best part is, even if your fire burns down and your grill temperature drops to 400 or so, you could still cook a frozen DiGiorno at that temp. 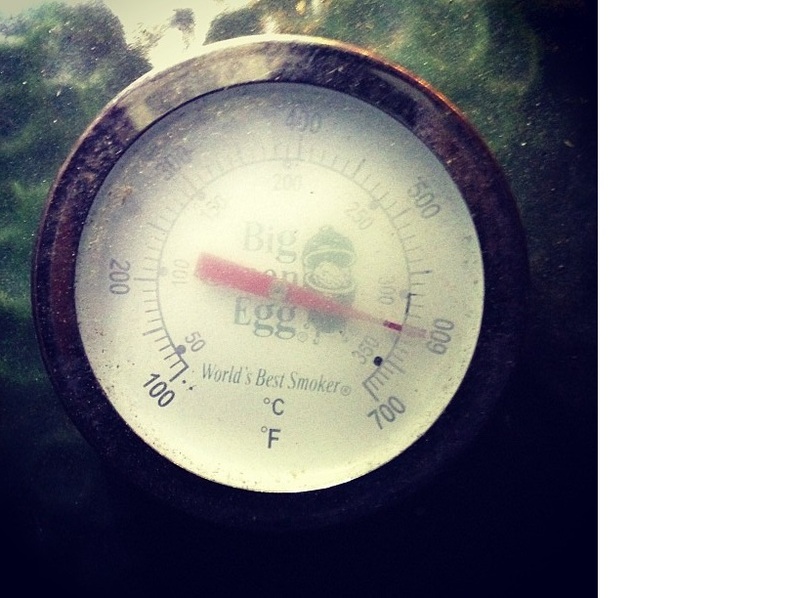 It just takes longer at a lower temp. We took different pictures each time we’ve made pizza. So the raw pizza (pepperoni and basil) and the finished pizza (pancetta and olives) look a little different. 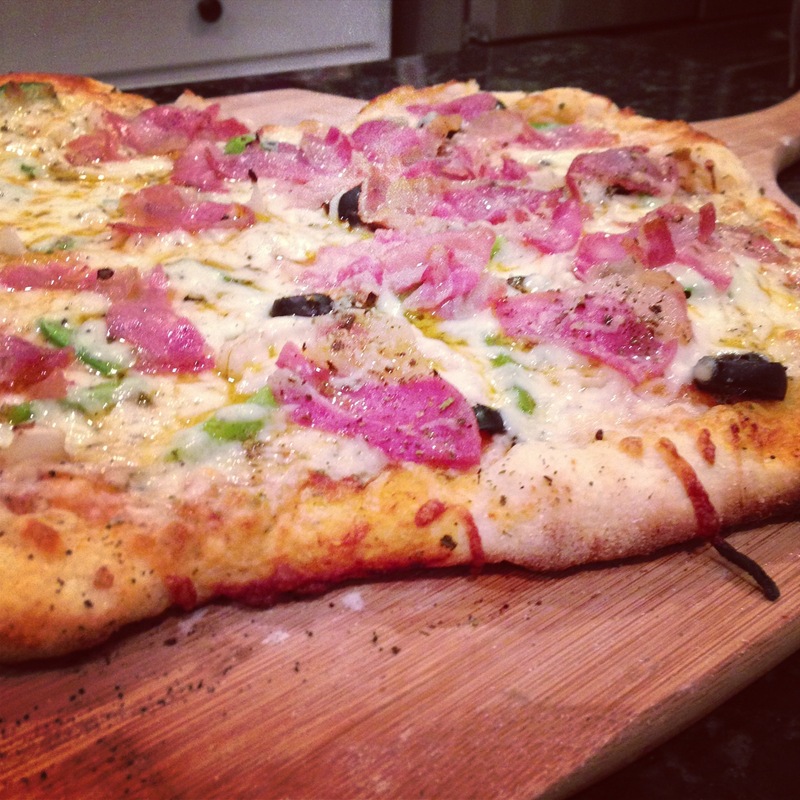 A pizza stone rated for higher than oven temperatures. 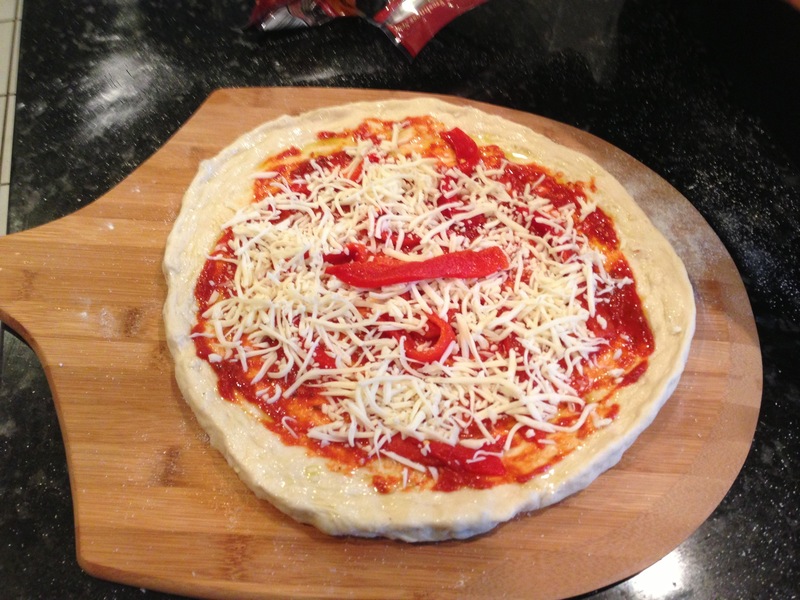 Your Pampered Chef pizza stone may seem like a good idea, but you will probably crack it the first time you use it. 1. If you’re using a ball of dough, it needs time to warm up before you handle it. The directions printed on the package recommend leaving it out for an hour or so before starting to work with it. 2. Spread cornmeal on the pizza peel to prevent the dough from sticking. Have flour on hand for your hands. 3. 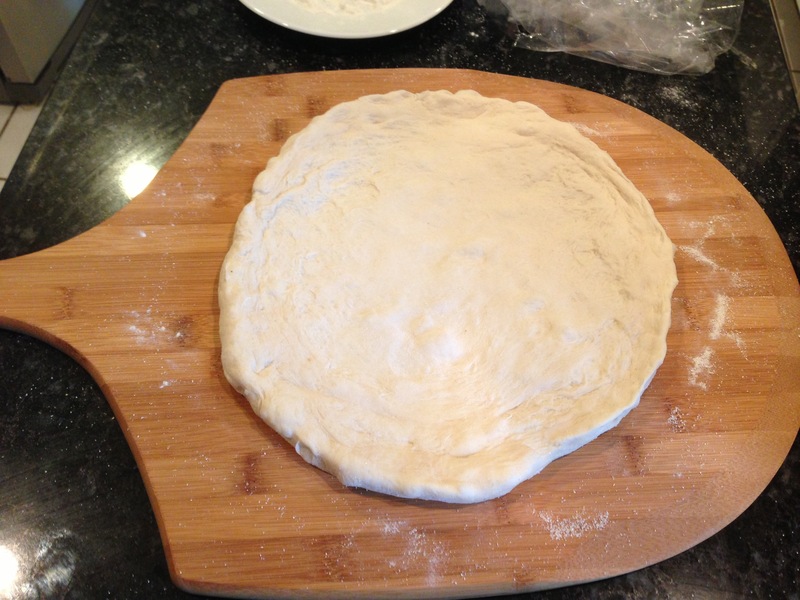 Stretch the dough to roughly the size of the pizza stone. You want your pizza to be roughly circular. A little overhang will char the edge of the crust. But don’t worry, no overhang will still leave you with plenty of crunch to your crust. 4. If this gives you fits, take a rolling pin, drop flour on it so it doesn’t stick to your dough and just roll it out into a circle shape. You can work the dough to death, so roll it out before that happens. I am BAD at this. The wife is Sicilian and, I think, she came pre-engineered to stretch pizza dough almost effortlessly. 1. Open your Egg. Load it with lump charcoal. Light the fire. 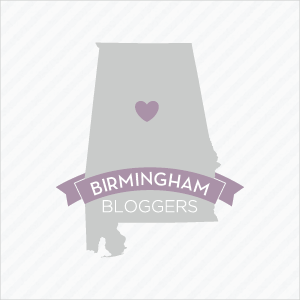 Ultimately, you’ll be setting up for indirect heat, but first you want to get it really hot. 2. Leave the bottom vent all the way open. Leave the DFMT top off of the Egg. You want to permit as much airflow as possible to raise the temperature. 3. Let it get REALLY hot. Like 700F hot. 4. 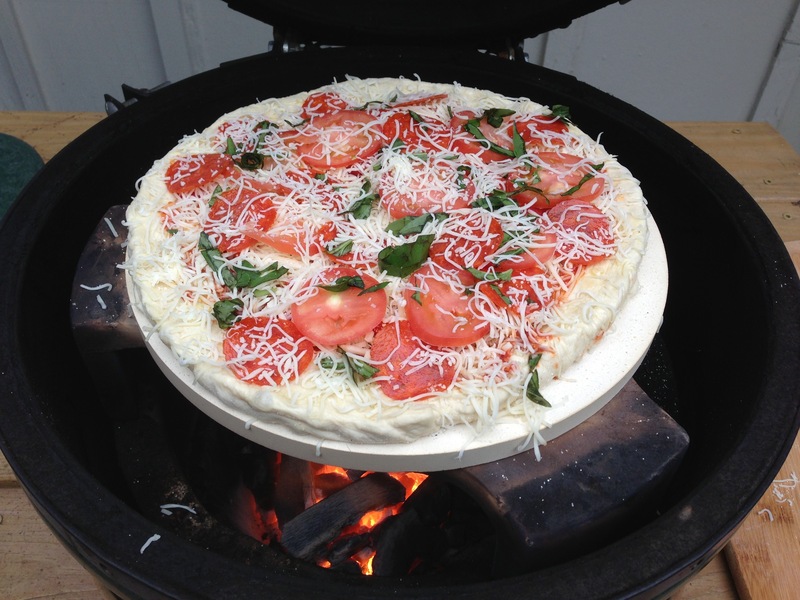 Place the platesetter, feet down and pizza stone together on top of the fire ring. You want them to preheat at the same time. While your grill is open, dust some cornmeal across the top of the pizza stone to prevent the pizza from sticking while it cooks. 5. Close the Egg and let it re-preheat. You will have dropped to 500 to 550F adding the platesetter. Ideally, a good pizza oven is 600F+. 6. Once you reach 600F and hold it for 15 minutes or so, add the DMFT top. You’ll retain heat fine once the ceramic gets this hot and stays there. 1. 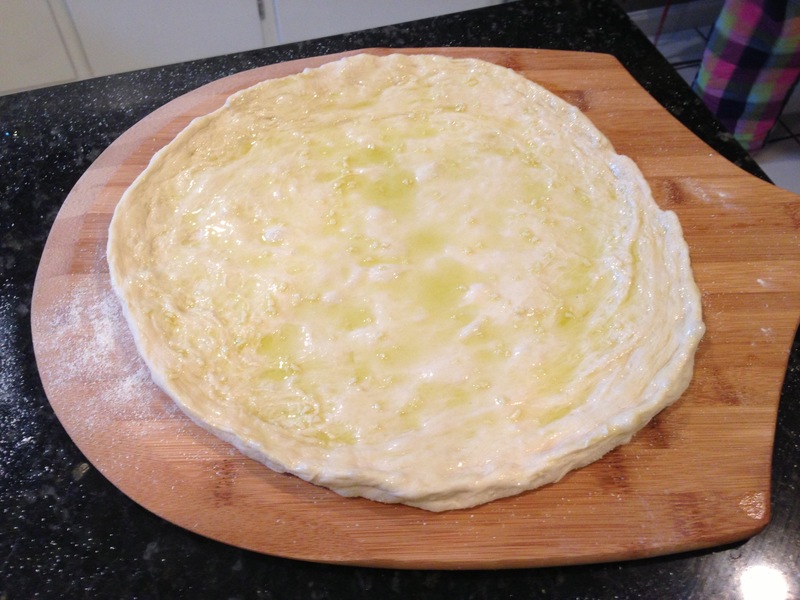 Brush olive oil and minced garlic over the surface of the pizza dough or crust. 2. Spoon a couple Tbsp of pizza sauce and brush it over the olive oil. Use more if you like more sauce. Sprinkle with some Parmesan if you like. 3. Add your toppings. Add vegetables first. Add meats (except for pepperoni/bacon type meats). 4. Add mozzarella chesse. Grab a handful and sprinkle it over the entire pizza. Don’t worry if it hangs off the edge. This is a good thing. 5. Add pepperoni and ham/bacon type meats. Sprinkle lightly with additional mozzarella and Parmesan. 1. 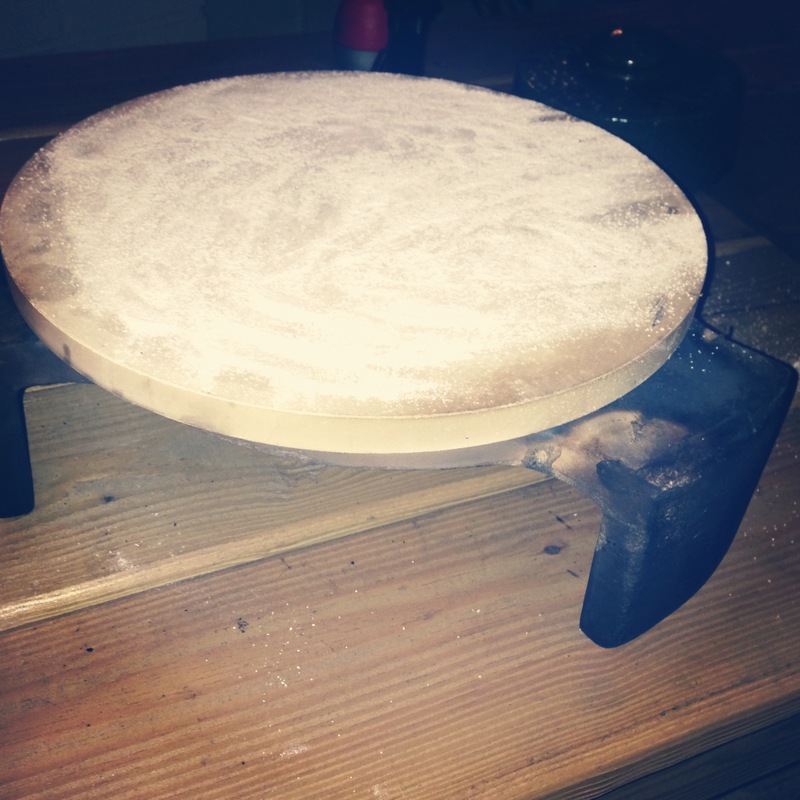 Take the pizza out to the Egg and shimmy the pizza off of the pizza peel and onto the baking stone. 3. Just like a DiGiorno in the oven, you’re looking to see the crust start to brown and the cheese to melt. I sometimes remove the DMFT and shine a flashlight down into the cooking chamber to look without opening the lid. 4. At 600F, this should take no more than about 6 to 8 minutes. 5. Take a spatula and the pizza should lift up off the stone and you can slide it back onto the pizza peel to carry inside. Shimmy the finished pizza off of the pizza peel and onto a cutting board. 6. Wait 5 minutes or so and slice the pizza. Top with additional parmesan cheese to taste. The pizza below has pancetta, black olives, green peppers and onion.